How do you plan on installing your fence posts? When you decide to DIY when it comes your fence, you’ll have a lot of decisions to make. One of those decisions has to do with fence posts. How do you plan on installing your fence posts? Are you worried they might shift or fall over if you don’t do it correctly? Luckily, we’ve put together this guide for how to install fence posts that don’t move. Here is some helpful advice to keep in mind! Once you get started on your DIY fence, make sure you have all the tools and materials necessary. It won’t matter which fence material you choose or what you’re using the fence for if you don’t have the strongest posts possible. 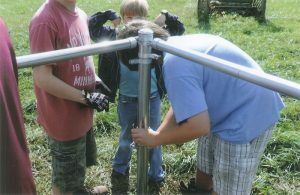 Weaker posts can be knocked over by high enough winds or the simple force of gravity. It’s also important to bear in mind that some fences are more vulnerable to wind damage than others. For instance, privacy fences have no way to let wind pass through. The wind can pull down the fence because all of the wind is hitting the fence’s surface. Another to think about is weight. Heavier fences will be harder for your fence posts to support. Because split rail fences are more spread out, they’re more capable of withstanding fierce winds. Whichever type of fence and post you select, just make sure they’re stable enough to meet your needs. The next decision you’ll have to make is choosing between gravel and concrete. These two stone components will be the anchors that help keep your fence and your fence posts in place. Gravel can keep moisture damage from affecting your fence post. Also, pieces of crushed gravel can be arranged to resemble concrete. Gravel is also easier to deal with if you decide to take down or move your fence. But the thing is, concrete is far more stable than gravel is. You can’t always use gravel to replace concrete – sometimes you just need concrete. If the soil in your yard is too sandy, you will need to use concrete to support your fence posts. When you’re trying to determine which type of concrete to use, go with premixed concrete, since premixed concrete will provide more stability. This entry was posted on Friday, August 25th, 2017 at 1:01 pm. Both comments and pings are currently closed.